Lucas has a sincere passion for writing. His favorite past-times include reading novels and anything outdoors with his kids. Have You Written a Disclaimer, Yet? 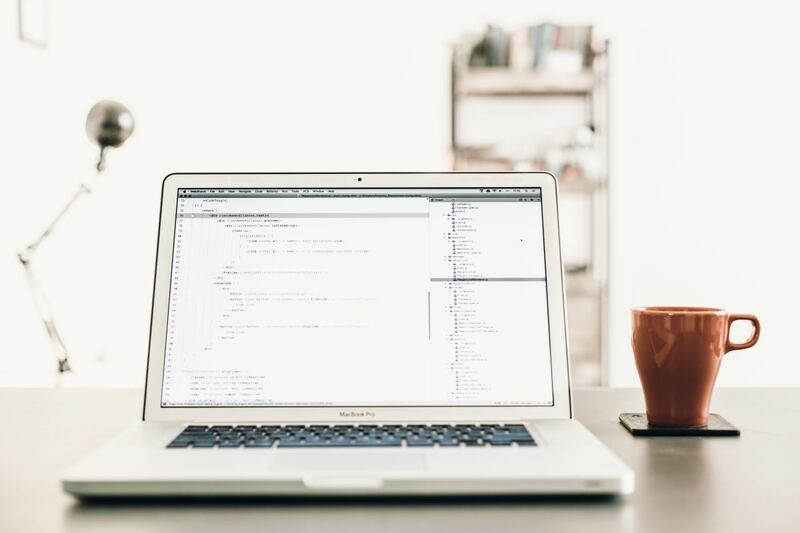 Learning how to write a disclaimer is something many of us need to do—especially if it involves selling something or providing a service via a webpage or blog. The use of a disclaimer is becoming more and more of a necessity these days. Any person, for any reason, may decide that there is something on your website or blog (something that you have written) that is in some way offensive or unacceptable either politically or socially. As a result, the reader may even decide to sue you (and we all know how easy it has become to do that). So, to keep your beloved hide in one piece and your money in your wallet, it is in your best interests to write yourself a disclaimer—just to be safe! 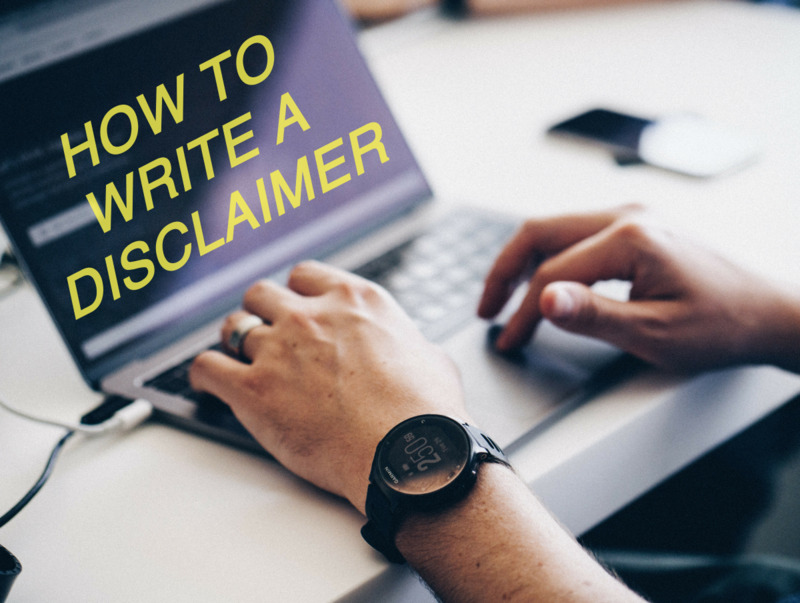 The writing of a disclaimer can be a difficult task for someone who has never written one before, therefore, I am going to provide you with a brief guide that you may use and follow. Explain that there are personal opinions expressed in your content. Convey that you have no bad intentions. Explain that you are not responsible for comments from others. Be transparent and provide contact information. Include a legal statement to protect yourself. First things first, you will need to decide what kind of information to include in your disclaimer. A disclaimer is basically a declaration, so you may just want to declare some or all of the above. What I do know is that writing a disclaimer can be a fun experience, because they can be written interestingly and have the potential to attract readers. I read blog disclaimers often and have found some really well-written ones that were great to read. Why not write your own disclaimer today? 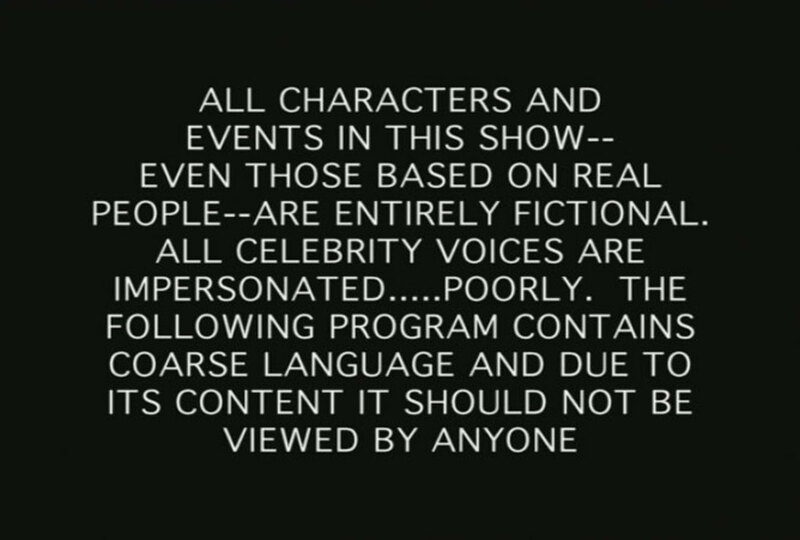 This example of a disclaimer expresses the nature of language in a show. You will need to convey to your readers that your blog/website is a personal blog/website and that all articles and opinions contained within are your own. Example: I, the author of the content that can be found here within can assure you, the reader, that any of the opinions expressed here are of my own and are a result of the way in which my highly disorganized and somewhat dysfunctional mind interprets a particular situation and or concept. Explain to your readers that your personal opinions and writings are not meant to defame, purge, humiliate, and/or injure anyone should they decide to act upon or reuse any information provided by you. Example: I would like to expressly convey to you (the reader) that were I to accidentally defame, purge, humiliate, and/or hurt someone's person or feelings as a result of them reading and/or acting upon any or all of the information and/or advice found here at my site, it is entirely unintentional of me to do so. Mention the fact that any comments left by any other independent reader or author are the sole responsibility of that person. Example: Any comments that may be found here at (your site name) are the express opinions and or the property of their individual authors. Therefore, I the owner/author of this site can not be held responsible for the fact that the minds of the respected authors may just well be as dysfunctional as my own, if not more . . . and it is not a practice of my own to edit any comments left here by others. Include a paragraph or two requesting your readers to contact you directly via email should they wish for you to remove any content that they have identified as being sensitive, harmful, or unnecessary. Example: Should you (the reader) identify any such content that is harmful, malicious, sensitive, or unnecessary, I request that you contact me via email so I may rectify the problem. Failing that you may like to just sit and weep incessantly! The last thing you may like to include is a legal statement referring to any applicable laws and/or regulations pertaining to the country in which you live. A legal statement is something that you may need to speak to a lawyer about. I am not a lawyer and therefore can not recommend what you should write. I am also unsure of whether or not a self-written disclaimer would stand up in a court of law or not. Again, that is something you would have to speak to a lawyer about. This blog disclaimer has to be the longest I have ever read, however, it is fabulously written. It is titled: Legal Redux: Herche's Blog Disclaimer. Because the World Wide Web is an integrated net of communication, discussion, and litigation, this website encourages the distribution of its content. Cross, reciprocal or just plain friendly hyper-linking is consistent with this information sharing and this disclaimer should not be construed as a condemnation of any linking practices. That said, any reproduction of this website’s content must credit the website by name and Uniform Resource Locator (URL). Should you link to this domain or use, reproduce, republish, regurgitate, repeat, reiterate, rebound, reecho, reverberate, mimic, imitate, parrot or duplicate the information contained on this website, you alone are responsible for that action and should, under threat of litigation, credit this website by name and URL. This website is not recommended for inmates, ingrates or anyone professing an irrational fear of cats or any other mammal, those who have a penchant for time wasting, illiterates, and lawyers. Women who are pregnant or may become pregnant or are nursing are advised to consult their husband and physician before reading this website. Eating before reading may result in unhealthy indigestion. Not recommended for people over the age of 120. Recently I was asked what the keywords were for this hub, the following list of keywords are the most relevant according to Google. How To Write A Disclaimer, How To Write A Disclaimer For A Blog, How To Write A Disclaimer For A Book, How To Write A Disclaimer Form, How To Write A Disclaimer For Music, How To Write A Disclaimer For An App, How To Write A Disclaimer For A Video, How To Write A Disclaimer For Photos, How To Write A Disclaimer For An Event, How To Write A Disclaimer For An Article. If you have not got access, I just checked the link and it has been changed to invitation only readership. Not sure why. Anyway, you can still use it and you may use the disclaimers that I have written here, too. All I ask is that you link to this hub. PS. As far as ledux goes, I am sure that they are either not actively blogging anymore, so if you use it just put a link to the following page just to be safe. What if we haven't been granted access to Herche's Blog Disclaimer and therefore, can't link to it? Thanks for this information. It is really very helpful. Only if you agree to place a link to it. Give credit where credit is due. Can I Use This Disclaimer. Thanks for all the nice comments, It is good to know that my efforts are being appreciated. I loved your page, and it will be very helpful to me. I am writing a book about how another book that I edited for my publisher friend to publish. After my former friend and I parted ways, I looked through the book again and found some really questionable and misleading passages that I (somehow) didn't see before (maybe because my friend and I were having an emotional -- not sexual -- "affair"). Now, I have to warn potential readers of these passages. Without some kind of disclaimer, this book could cause me much lawsuit heartbreak. However, I have to do what I believe to be the right thing. Thank you very much for the creative disclaimers and the humor that they used. LOL! I have written a disclaimer for my blog as it is a requirement to get your blog up, but I used an application wherein you just need to supplement questions with what your blog is all about, I also know people who copy disclaimers from other blogs. This one helps particularly to people who are having a hard time how to get their blog up. Thanks Luke! You can use it provided that you place a link to this hub. Give credit where credit is due, so to speak. Wow - I've learned exactly what I was hoping for. Every writer should read this. I'll do my part by sharing it. A huge thank you! Thanks for this information. I'm just starting up a website and had no idea what I should include in a disclaimer. It's very worrying having to cover yourself for everything you say in case someone, somewhere gets upset. I think it is about being civil and nice, I am sure you need disclaimers for everything. If you are really concerned you should contact an attorney.